Will communal lunch for elementary school students ever come to SFUSD? The idea of small groups of younger students (in pint sized chef’s attire) serving each other lunch from family style bowls under the watchful eye of an adult, is inspired by the school lunch program in Japan. It also appears as one of the suggested “innovations” for SFUSD to adopt as part of their Future Dining Experience, although even in the US, the idea is not new. Communal lunch has already been implemented in some US schools; the highest profile are a group of mostly private and charter schools in the Philadelphia area. 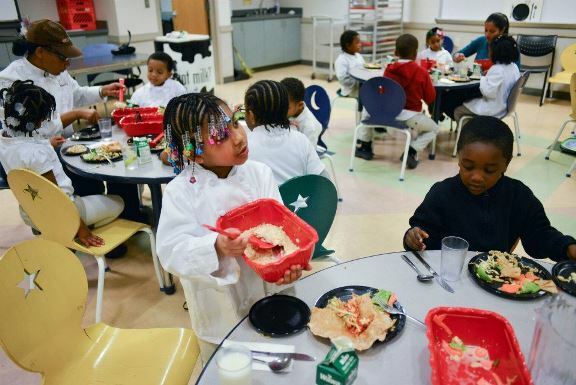 Eatiquette, brainchild of Philadelphia’s Chef Marc Vetri, began in 2012 and uses a communal lunch model one day a week in their 8 participating schools. Webster Elementary School in Minneapolis is also using the communal lunch model, according to this article in Food Management magazine. The biggest stumbling block for schools wanting to use the communal, or “family style” service for meals, as opposed to the traditional cafeteria lunch line, is labor. Family style meal service requires what USDA regulations call a “supervising adult” at each table to offer the full serving of each food item to each child, and later to “encourage additional portions and selections as appropriate” for those students who took just a small taste the first time around. In other words, there would need to be enough adults in the cafeteria to make sure that every single child took the proper amount of food, and to actively encourage those who didn’t to take more. For SFUSD’s more than 75 elementary schools, this increased labor could potentially involve hundreds of new workers in addition to the 250 already employed districtwide; the cost of that would be astronomical. But Minneapolis Public Schools’ (MPS) Webster Elementary has solved this problem brilliantly. The refurbished school building reopened in September 2015 after being closed for ten years; it currently enrolls 96 children in K-2, with plans to add a grade each of the next 3 years. “Expansion of the program will depend on schools and principals being ‘100 percent willing’ to implement it because it takes a commitment from the school staff to sit at the tables and oversee the food serving, [MPS director of culinary and nutrition services Bernard] Weber explains. At Webster, the staff was hired knowing that this would be part of their responsibilities. Webster’s current enrollment of 96 students fit nicely at 12 tables for 8, and with this year’s school staff of 24, that’s more than enough to ensure an adult at every table. Presumably more staff will be added as the school adds grade levels, and family style lunch will be part of their duties too. Problem solved! Of course, if SFUSD wants to implement the communal lunch at every elementary school, as called for in the Future Dining Experience plan, they will have a hard time using that same staffing strategy. SFUSD rarely opens new schools. In fact, SFUSD has only opened 2 new K-5 schools in the past 10 years (Chinese Immersion School at De Avila in 2009, and Dianne Feinstein Elementary in 2006) so requiring teachers to eat lunch with their students, even just once a week, would have to be negotiated into the existing teacher contract. That won’t – and shouldn’t – come free. For elementary school teachers, lunch is the only time they can count on during the school day to take care of urgent business like using the restroom or making a quick phone call. Even if they were willing to sacrifice that time once a week to improve the lunch experience for their students, most SFUSD schools don’t have the necessary staff to student ratio of 1:8 needed to meet federal meal rules. One possible solution would be to recruit volunteers to make up the needed number of adults for a communal lunch. Could Ron Conway’s Circle the Schools help? Essentially, companies like Salesforce, Zynga and AdRoll are paired with a school and send volunteers to help with whatever the school needs. How about sending some techies to eat lunch with SFUSD students once a week? This could work at one or two plot sites like Bret Harte, or George Washington Carver ES, which is already partnered with SquareTrade. But if the communal lunch is successful and SFUSD wants to bring it to every school, the cafeteria workers union, SEIU, is likely to object. Serving meals to students, and ensuring that each student has chosen enough food to meet federal regulations, are part of the cafeteria worker’s job. While the union has pretended not to notice one-off pilot projects that replace their own workers with volunteers, they are hardly likely to agree that hundreds of hours of what should be paid time for their members should instead be performed by volunteers at over 75 elementary schools across the city. More likely, communal lunch in SFUSD is never going to expand beyond a handful of high needs schools. That’s not to say it’s not worth doing – anything that helps more kids eat and enjoy school lunch is always worth doing. But if SFUSD parents are eager to make sure that their own child gets to experience communal lunch, better plan to enroll at Bret Harte. Dana Woldow advocates for policies, including soda taxes and better school meals, to improve the health of all children through better nutrition and education. She has been a leader in improving school food in San Francisco since 2002, when she formed a school nutrition group to run a pilot removing junk food from SFUSD’s Aptos Middle School, where her children were students; the pilot was expanded to all of the city’s public middle and high schools in 2003. She served as co-chair of the SFUSD Student Nutrition and Physical Activity Committee from October 2003 to June 2011.